הָחוֹתֵךְ כְּרִיכוֹת וְעָתִיד לְעַמְּרָן, וְכֵן אוֹגוּרֵי הַשּׁוּם וַאֲגוּדּוֹת הַשּׁוּם, וְהַבְּצָלִים, אֵין לָהֵן שִׁכְחָה. הַמְעַמֵּר מִפְּנֵי הַדְּלֵיקָה וּמִפְּנֵי אַמַּת הַמַּיִם, אֵין לָהֵן שִׁכְחָה מִפְּנֵי שֶׁעָתִיד לִבְחֹן. מַעֲשֶׂה בְּחָסִיד אֶחָד שֶׁשָּׁכַח עוֹמֶר בְּתוֹךְ שָׂדֵהוּ וְאָמַר לִבְנוֹ, "צֵא וְהַקְרֵיב עָלַי פָּר לְעוֹלָה וּפָר לִשְׁלָמִים." אָמַר לוֹ, "אַבָּא מָה רָאִיתָ לִשְׂמוֹחַ בְּמִצְוָה זוֹ מִכָּל מִצְוֹת הָאֲמוּרוֹת בַּתּוֹרָה?" אָמַר לוֹ, "כָּל מִצְוֹת שֶׁבַּתּוֹרָה נָתַן לָנוּ הַמָּקוֹם לְדַעְתֵּנוּ. זוֹ שֶׁלֹּא לְדַעְתֵּנוּ שֶׁאִילּוּ עֲשִׂינוּהָ בְּרָצוֹן לִפְנֵי הַמָּקוֹם לֹא בָּאת מִצְוָה זוֹ לְיָדֵינוּ." אָמַר לוֹ, "הֲרֵי הוּא אוֹמר (דברים כד:יט) כִּי תִקְצֹר קְצִירְךָ בְשָׂדֶךָ וְשָׁכַחְתָּ עֹמֶר בַּשָּׂדֶה, לֹא תָשׁוּב לְקַחְתּוֹ, לַגֵּר לַיָּתוֹם וְלָאַלְמָנָה, יִהְיֶה, לְמַעַן יְבָרֶכְךָ ה' אֱלֹהֶיךָ, בְּכֹל מַעֲשֵׂה יָדֶיךָ. קָבַע לוֹ הַכָּתוב בְּרָכָה. וַהֲלֹא דְבָרִים קַל וָחוֹמֶר? מָה אִם מִי שֶׁלֹּא מִּתְכַּוֵּין לִזְכּוֹת וְזָכָה מַעֲלִין עָלָיו כְּאִילּוּ זָכָה, הַמִּתְכַּוֵּין לִזְכּוֹת וְזָכָה עַל אַחַת כַּמָּה וְכַמָּה. כַּיּוֹצֵא בוֹ: (ויקרא ד:כז-לא) וְאִם נֶפֶשׁ אַחַת תֶּחֱטָא בִשְׁגָגָה, מֵעַם הָאָרֶץ, בַּעֲשֹׂתָהּ אַחַת מִמִּצְו‍ֹת ה', אֲשֶׁר לֹא תֵעָשֶׂינָה וְאָשֵׁם. אוֹ הוֹדַע אֵלָיו חַטָּאתוֹ אֲשֶׁר חָטָא וכו' וְכִפֶּר עָלָיו הַכֹּהֵן, וְנִסְלַח לוֹ. וַהֲרֵי דְבָרִים קַל וָחוֹמֶר! מָה אִם מִי שֶׁלֹּא מִתְכַּוֵּין לַחֲטוֹא וְחָטָא מַעֲלִין עָלָיו כְּאִילּוּ חָטָא, הַמִּתְכַּוֵּן לַחֲטוֹא וְחָטָא עַל אַחַת כַּמָּה וְכַמָּה." 1. In Mishna Peah 6:10 there are a few variant readings in different manuscripts that significantly alter the meaning of the Mishna. The text of the Mishna that resembles the text of our Tosefta the closest is from Manuscript Parma (Biblioteca Palatina, Parma, Manuscript 3173 (De Rossi 138)). It states that grain which has been dedicated for destruction (i.e. non-human consumption, such as animal feed or fuel), or [grain that has been dedicated] to be tied into single sheaves [without any intent to stook them into stooks and stack them into stacks,] and also [a person who is piling up] heaps of garlic [with intention to make from the heaps] bundles of garlic, or [spread out] onions, [later and not right away, if any of these gavels of grain or heaps of garlic, or spread out onions, have been forgotten in the field, the law of] Shikcha (forgotten sheaves) does not apply to them. The first statement in our Tosefta expands on this law and will be explained in detail in the following notes. The second statement of the Tosefta states a new law, which is not discussed in the Mishna on a similar subject of what type of harvested grain does not qualify to be considered Shikcha if it was forgotten. Notice that the Mishna specifically uses the word אלומה (Aluma), "sheaf”, as a technical term to emphasize that these sheaves are intended to be kept as small single sheaves that will not be stooked or stacked, which is what is done normally, as was already explained above in Tosefta Peah 3:5, notes 2-4. The Tosefta’s case of the sheaves is slightly different than the Mishna’s. In the Mishna the farmer planned not to stook the individual sheaves and leave them as they are. But in the Tosefta the farmer planned to leave untied gavels in the field and not tie them into sheaves until later. I have shown photos of the three main Mishna manuscripts below to emphasize the difference in the readings of the Mishna. As can be seen from them only the Parma manuscript follows closely the language of the Tosefta, whereas the Kaufman Manuscript (Hungarian Academy of Sciences, Budapest, Kaufmann Collection, Manuscript A50) and the Munich Manuscript (Bayerische Staatsbibliothek, Munich, Manuscript 95) have different readings with different meaning. 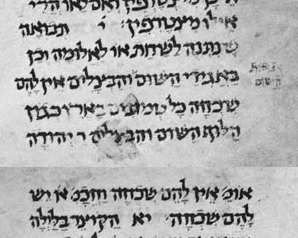 Mishna Peah 6:10 from the Parma Manuscript. Mishna Peah 6:10 from the Munich Manuscript. Mishna Peah 6:10 from the Kaufmann Manuscript. 2. For an explanation of what gavels are see above Tosefta Peah 3:10, note 2. 3. As was explained above in Tosefta Peah 3:10, note 2, and is clearly visible there on Abel Grimmer’s painting, An Allegory of Summer, the standard harvesting procedure was for the front row of harvesters to cut the gavels of grain with sickles and then for the second row of harvesters to immediately tie them into sheaves. However, if for whatever reason the farmer decided not to tie the gavels right away, but rather leave them in the field untied until a later point in time, then the process of making sheaves remains incomplete until the sheaves are actually tied and therefore if a gavel is forgotten and does not qualify to be considered Shikcha, since Shikcha requires the process of bundling sheaves to be completed. 4. The correct reading here is אוֹגוּרֵי (Ogurei), meaning “heaps”, as it appears in the Erfurt manuscript, and not אֲגוּדֵּי (Agudei), meaning “bundles”, since that does not make any sense for two reasons. First the next word in the Tosefta is bundles of garlic, so it would be repetitive, and second it would make sense from the harvesting procedure point, since garlic is first heaped into piles and then tied into bundles as will be explained in the next note. 5. Garlic is a very gentle vegetable which requires very careful handling. 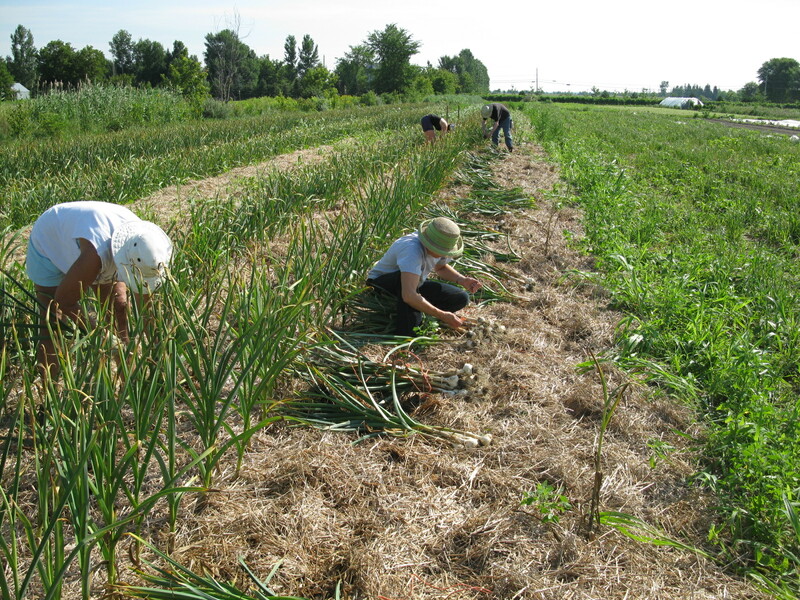 Even today garlic is usually picked by hand so that it would not get damaged by equipment. Once it is picked it is carefully piled into heaps in the field. Garlic requires curing (drying) after it is picked for about 2-4 weeks in order to prepare it for storage. Curing causes the garlic bulbs to become completely dry, which enables them to remain fresh for a few months without refrigeration. This is commonly done by tying up individual bulbs of garlic into bundles and then hanging them up in a cool dry spot. 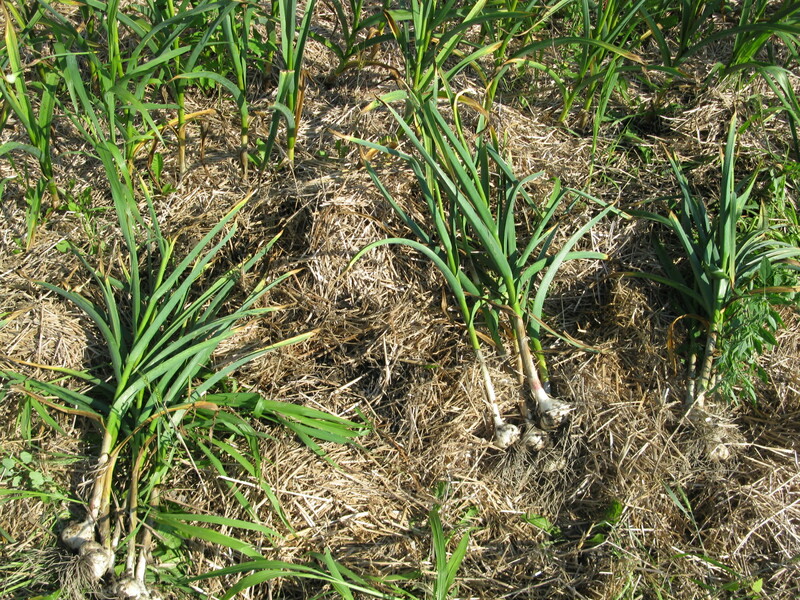 Normally the garlic is tied into bundles immediately after it is piled into heaps. The procedure was probably done on a massive scale by two rows of farmers in a similar fashion as making sheaves from gavels of grain. The front row would pick the garlic by hand out of the ground and pile them into heaps and then the back row would come behind them, tie each few garlic bulbs into bundles, and then transport them to a barn for curing. However, if for whatever reason the farmer decided to leave heaps of garlic bulbs in the field and bundle them later, then if one of those heaps was forgotten, Shikcha does not apply to it since the process of bundling was not completed. Heaps of garlic piled in the field during garlic harvest. Tourne-Sol Cooperative Farm, Les Cèdres, Quebec, Canada, July 2011. Photo: goingtoseed.wordpress.com. Notice the heaps are not tied yet, but are spaced out in a way so it would be easy to tie them. Farmers picking and tying garlic into bundles. Tourne-Sol Cooperative Farm, Les Cèdres, Quebec, Canada, July 2011. Photo: goingtoseed.wordpress.com. Notice the bundles are picked by some farmers and tied by others for efficiency. 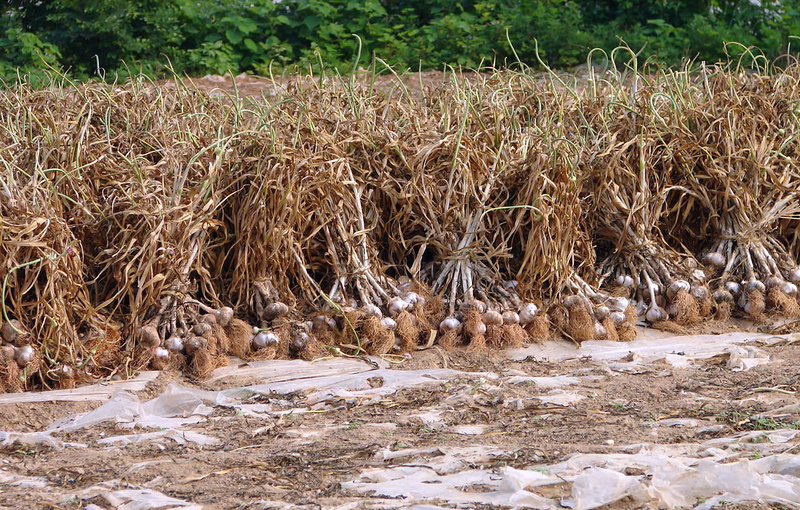 Harvested garlic awaiting collection in rural Goheung county, South Jeolla province, South Korea, October 2007. Photo: Steve46814, Wikimedia Commons. 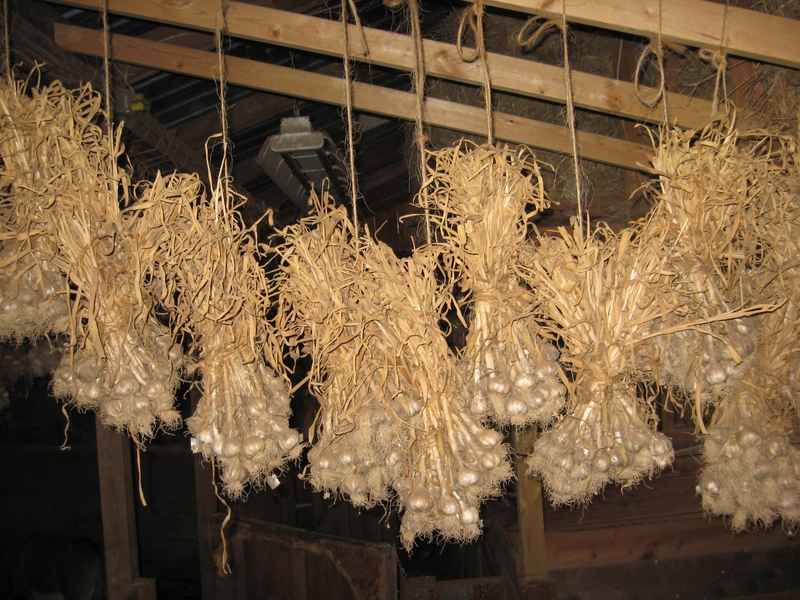 Notice that individual garlic bulbs have been tied into bundles ready to be hung up for curing. Hanging garlic bundles curing in a barn. Wooleylot Farm, Potter County, Pennsylvania, November 2011. Photo: wooleylot.wordpress.com. 6. Onions were harvested in a similar manner to garlic, by hand, but they were not tied into bundles for curing, because they are too big and heavy and it is not practical to bundle them. Instead onions were dried in the field in the open, for a few days, and then after that they were transported into a barn. The Tosefta specifically does not mention “bundles of onions”, but rather it just says plainly “onions”, in order to emphasize that it is referring to spread out onions which are being cured and not bundles. Shikcha would apply to onions after they have been cured in the field and ready for transport into barns, which would be the completion of the harvesting process of onions. However, onions that were just forgotten in the field before the initial curing process has been completed are not yet considered to be harvested and therefore Shikcha does not apply to them. 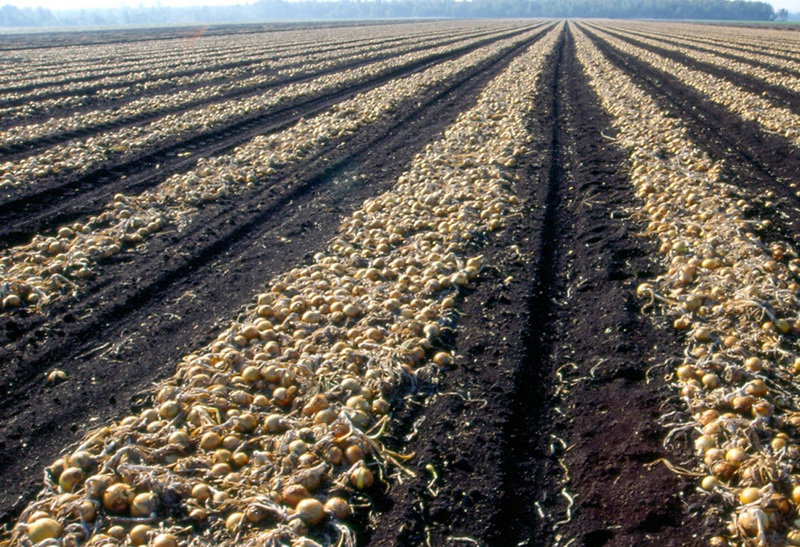 Onions curing in a field. Ontario, Canada. Photo: www.omafra.gov.on.ca. Notice that they are spread out and not tied into bundles like garlic. 7. It is obvious that the whole point of this law is to allow the owner to go back to the field and retrieve his forgotten gavels of grain or garlic or onion bulbs, once he remembered that they were left there, since there is no way for the poor people to know if the gavels or bulbs were forgotten by the farmer before he completed the harvesting process or after he completed the harvesting process. Tosefta Peah 3:10 clearly stated that Shikcha does apply to gavels of grain, so the difference between our case here and that Tosefta is the intent of the owner, and not the gavels or bulbs themselves. Hence, the whole point of this law is let the owner know if he is allowed to retrieve them or not, and not for the poor to know if they are allowed to take them or not if they see them. Once the owner of the field allowed the poor to go into his field and collect Shikcha, the poor can assume that any gavel forgotten in the field can be taken by them as Shikcha, since the harvesting process must have been completed by the farmer, because otherwise he simply would not allow them to go into his field to collect Shikcha. 8. As was explained earlier in Tosefta Peah 3:5, note 1, the expression of מְעַמֵּר (Meamer), “binding sheaves”, can refer to either binding a single sheaf, stooking, or stacking, depending on the context. In this particular Tosefta it is used in a more generic fashion. It makes no difference whether the farmer is binding a single sheaf, stooking or stacking, and this law would apply equally to all of these cases. The whole point of the Tosefta is the reason why he is doing it, which is not for the purpose of harvesting, but rather in order to get them out from the approaching fire or flooding water. 9. אַמַּת הַמַּיִם (Amat Hamayim) usually refers to an irrigation canal, although it can also mean a river-arm. I have chosen to translate it as “irrigation canal”, since in the Land of Israel there are almost no rivers that flow all year around and most field were irrigated by artificial canals which received water collected in pits or from flash floods. 10. The correct translation of the word לִבְחֹן (Livchon), is “to check”, as pointed out here by Saul Lieberman in Tosefta Kifshuta. See Michael Sokoloff, “A Dictionary of Jewish Palestinian Aramaic,” Bar Ilan University Press, 2002, p. 90, entry בחן, who points out that in Syriac this word has the same meaning. I have chosen the reading of both Vienna and Erfurt manuscripts, which is לִבְחֹן (Livchon), “to check”. The reading of the printed editions,לאבדן (Leavdan), “to lose”, meaning that whatever sheaves get forgotten will for sure be lost to the fire or flooding water, does not really make sense. Because if the farmer is going to lose them anyway for sure the poor should be allowed to take them, at least if not as Shikcha, then as Hefker (ownerless produce). However, the Tosefta implies that they cannot take them, because they are not considered Shikcha. If the Tosefta would have considered them Hefker it would have stated so explicitly as it did in other cases. For example, see above Tosefta Peah 1:5. The reading of Cheshek Shlomo, ליבדן (Livdan), which he explains means “to untie and spread on the ground in order to retie better” is completely unfounded and does not have a source in any extant or mentioned manuscript. It also does not make sense, because why would the farmer need to untie the sheaves in order to retie them better, since they are already tied, even if not perfectly? 11. Shikcha only applies if the sheaves were forgotten during harvest. However, if they were simply being moved out of the way of the fire or flooding water, which is clearly not a harvest, they cannot be considered Shikcha. Also, since the farmer knows that he is just moving them he will naturally try to get them all out and therefore as long as he has time he will go back and check for any forgotten sheaves. Although it may appear from the wording of the Tosefta that the reason why these sheaves, if forgotten, are not considered Shikcha is because the farmer will purposefully go back and check for them, that is not what the Tosefta really means. What it is really saying is that the farmer is allowed to go back and check for them, because they are not considered Shikcha. The reason being is I explained. 12. The Tosefta does not name the person by name. Chasdei David claims that this story is about Rebbi Yehuda Ben Bava. His reasoning is that Talmud Bavli (Bava Kama 103b) says that anywhere in Talmudic literature when it says מַעֲשֶׂה בְּחָסִיד אֶחָד (Maaseh Bechasid Echad), “it happened with a certain pious person,” it is a reference to either Rebbi Yehuda Ben Bava or Rebbi Yehuda Ben Rebbi Ilay. Chasdei David asserts that out of these two people only Rebbi Yehuda Ben Bava lived before the destruction of the Second Temple, whereas Rebbi Yehuda Ben Rebbi Ilay was born after the destruction of the Temple, so since this story mentions sacrifices it must be referring to Rebbi Yehuda Ben Bava. I would like to point out that this identification is not correct. Rebbi Yehuda Ben Bava was killed by Emperor Hadrian’s soldiers at the end of the Bar Kochba Revolt, most probably in 135 CE, since he was killed after Rebbi Akiva’s execution, but possibly as early as 132 CE in the beginning of the revolt, while ordaining his five main students. See Talmud Bavli (Sanhedrin 14a) and Masechta Semachot 8:9. He was killed at the age of 80. See Midrash Eleh Ezkera, edition Jellinek, Leipzig, 1853, p. 11. This means he was born around 52 – 55 CE, 15 to 18 years before the destruction of the Temple, which took place in the year 70 CE. This means that when the Temple was destroyed Rebbi Yehuda Ben Bava was only 15 – 18 years old, too young to have a son to whom he could tell to go and bring a sacrifice. Of course, Midrash Eleh Ezkera, the source for his age, is late and of poetic form and may not be historically accurate. The only way for this story to work out is if Rebbi Yehuda Ben Bava’s son was born when Rebbi Yehuda Ben Bava was 18 years old and he himself would have been 18 years old before the destruction of the Temple, which would make Rebbi Yehuda Ben Bava 36 years of age in the year 70 CE. This would imply that he was born at the latest in 34 CE, being 98 years old at the time of his killing. Of course it is possible, but extremely unlikely. It must be that this rule cited in the Gemara about the identification of “a certain pious person” is not as universal as it sounds to be, because it is in contradiction with other facts as I have mentioned. 13. For a description of Korban Olah see Vayikra 1:3-17 and Mishna Zevachim 5:4. 14. For a description of Korban Shlamim see Vayikra 3:1-17 and Mishna Zevachim 5:7. 15. The father got so excited that he now had the opportunity to fulfill the Mitzvah (commandment) of Shikcha, he decided to bring two sacrifices, and use a bull for each of them, the most expensive option, even though he had a choice to use a smaller, cheaper animal, such as a sheep or a goat, and for Korban Olah, he could have even used a bird. The son was certainly surprised by the father’s choice. 16. Since Shikcha could only be fulfilled accidentally, and not on purpose, it is a relatively rare commandment, hence the father’s great excitement. It should be noted, that in order to fulfill Shikcha it is not enough to just forget a sheaf and never realize that it has been forgotten. The farmer has to realize that he has forgotten a sheaf and yet not go back to get it. Only then Shikcha is fulfilled. Therefore it is not as common of an occurrence as one might think it is. 17. I have quoted the son’s response as it appears in the Erfurt manuscript. The Vienna manuscript has the wording confused and does not make any sense. The verse clearly says that the reason the farmer gets the blessing is not, because he forgot the sheaf, since that was an accident, but rather, because when he remembered about it he does not go back to get it. That act of not going back to get it is conscious. So the son asks the father, that from day-to-day life we know that if someone does something good by accident everyone considers it a good act and gives the person credit for it. So for sure we give credit to someone who has done a good act on purpose. In the case of Shikcha the Torah says that the farmer will get a blessing from Hashem if he does not go back and get the sheaf that he forgot. Why does the Torah need to say that? Of course the farmer should get a blessing, since he for sure gets credit for leaving the sheaf for the poor consciously. The Tosefta does not say what the father replied to the son. The son’s question can be answered in many ways. For example, the Torah wanted to emphasize that if he leaves the sheaf for the poor he will get a blessing, implying that if he goes back to get it then he will be cursed by God. The Torah merely used a positive expression to make people feel good about it. The son was being too technical with his question, and therefore such technicality did not really need an answer from the father. 18. I have quoted the verse that is written in the Erfurt manuscript, which is talking about Korban Chatat (sin-offering) of an individual. The Vienna manuscript refers to a different verse (Vayikra 5:17-18), which is talking about Korban Asham Talui (guilt-offering in case of doubt). Both of these sacrifices are brought in case of a violation of a negative commandment for which the punishment is Karet (excision), such as eating blood or forbidden fats (Cheilev), if it is violated on purpose. The difference between the two sacrifices is whether the person who committed the act knows about it for sure or not. If he knows for sure that he did the violation then he brings Korban Chatat, but if he does not know for sure and he is in doubt that may be he did not do it then he brings Korban Asham Talui. It seems to me that it does not really matter which verse is quoted by the Tosefta. The Tosefta’s point is merely that the violation was done accidentally and not on purpose, and yet it is still called a sin. So how much more so it is called a sin if it was done on purpose! 19. It seems to me that this is a statement and not a question as will be explained in the next note. 20. If we assume that the Tosefta is asking a question about some rhetorical part of the verse then it becomes not clear what the Tosefta’s point is and what the Kal Vechomer actually is. The verse is talking about an accidental act, so it is not obvious if it is a sin or not. The verse has to teach us that it is still considered a sin and therefore requires a sacrifice to atone for it. It seems that the Tosefta is merely making a rhetorical statement about how seriously the Torah takes sins, that if it considers an accidental act a sin, then how much more so it considers a conscious violation a sin and therefore the offender will for sure be punished. This second statement is not a part of the conversation between the father and the son. It is just an addition of the Tosefta to balance out the discussion about good acts with a similar comment regarding a bad act.